The fast-growing “Internet of Things” has pulled mobile operating systems like Android into everything from thermostats to light fixtures. With the sensor kit from Texas Instruments, developers can now experiment with an endless range of new products. But, most developers aren’t sensor and telemetry specialists. That’s where the TI-SensorTag Development Kit from Texas Instruments and the ready to use EOSPY-TI software make it easy by providing a complete ready to use system. 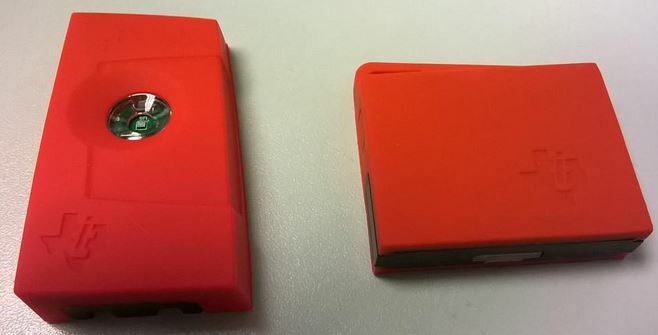 The previous version of the TI_SensorTag CC2541 (left), which supports Bluetooth Smart only, and the new version CC2650 (right), which supports Bluetooth, 6LoWPAN and ZigBee depend on the software stack used. The CC2650 consists of a Cortex-M0 RF core and a Cortex-M3 user application core. The V2 version of the tag has ten sensors in total. • EOSPY-TI Client provides GPS Map location for all sensors! • Ten sensors including support for ambient light, digital microphone, magnetic sensor, humidity, pressure, accelerometer, gyroscope, magnetometer, object temperature, ambient temperature, and simple button key press. 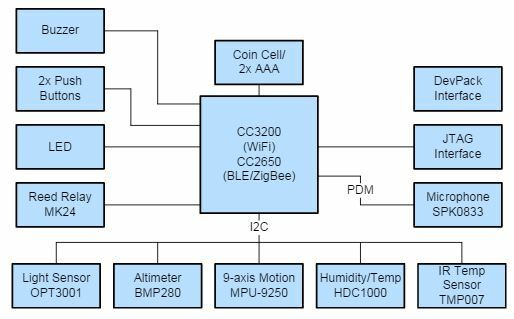 The sensor kit supports six common types of sensors: an IR temperature sensor, humidity sensor, pressure sensor, accelerometer, gyroscope, and magnetometer. The first three sensors measure environmental conditions important to practically all devices located in the field. The IR temperature sensor, for example, warns if a device’s motor is overheating. A humidity sensor can detect if moisture is penetrating a waterproof casing. And a pressure sensor can report on either excessive or substandard pressure. Taken together, these sensors can form powerful tools like a remote weather station. The accelerometer and gyroscope are especially important to mobile instruments, as they allow a device’s motion to be tracked independently of GPS or other external location measurements. Most smartphones already have these features, but the sensor kit handles a wider range of conditions than most smartphone components. Finally, the magnetometer measures magnetic fields and electric currents, providing a safe means of remotely monitoring electric grids and power generators. The power button can be accessed on the left side of the tag with the two window slits facing towards you. The LED will start flashing for ‘pair mode”. The button has multiple profiles as shown in the image below. The slits also act as a retainer for slipping in a strap for mounting purposes. The button on the right is similar in feel to the left one. The demo firmware allows it to cycle between different modes. A red/green LED is viewable through one of the window slits. Remove the silicone casing, the tag is projected by a hard plastic casing. It can be removed by pulling out the top tab slightly first and then sliding the plastic case out. The CC2650 sits on top surrounded by an InvenSense MPU-9250 9 axis and the other sensors, except the Microphone and Magnet sensor.